Chris has over 20 years experience providing activities and entertainment for children of all ages. They have performed at thousands of events all over the country, so whether it's a Council run holiday play scheme, holiday club or beaver group, you can be re-assured you will not find any other entertainers with more experience. 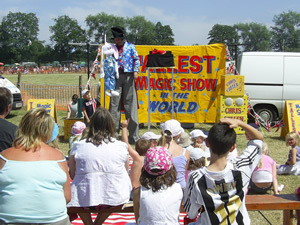 MAGIC SHOWS - We can provide various 45 minute - 1 hour shows featuring comedy magic, large puppets and loads of audience participation. Themes include Beach Party, Big Top Circus, Christmas etc. Great fun for children of all ages. TRADITIONAL PUNCH & JUDY - Professor Chris Cullen has been performing Punch & Judy for over 20 years and its popularity is better today than ever before. With an authentic Mr Punch voice and the booth over 8 feet tall, this is slapstick comedy at its very best. CIRCUS PUPPET SHOW - All the fun of the Big Top in a slap stick based puppet show starring Joey the Clown and featuring 'Ivor Hurnia' the strong man, lion and tamer, Gerald Giraffe, Sally the Seal etc. The show is full of audience participation. TALLEST MAGIC SHOW IN THE WORLD - A brand new attraction performed on stilts for extra impact, with a large yellow backdrop and magician standing over 8 feet tall, this is certainly an eye-catching show with a difference. Comedy magic, audience participation and colourful puppets make it a show to be remembered. CRAFT WORKSHOPS - Children find it very enjoyable making our masks, hats and puppets etc. All the materials are supplied including tables etc. FACE PAINTING - This is always popular with children and adults. Julie is a very experienced face painter and attends events large and small, she is fully self contained including gazebo if weather conditions prevail. MINI DISCO - We can provide a mini disco on its own or can incorporate games, competitions, comedy magic, puppet a full entertainment package. STILT WALKING - Various colourful costumed characters ideal for mix 'n' mingle, being over 8 feet tall we are guaranteed to stand out from the crowd. They can simply meet 'n' greet, make balloon models or perform strolling magic working as a duo or solo depending upon your requirements. WALKING ILLUSIONS - If you are looking for something unique, then this is it. With 3 different characters to meet 'n' greet the guests, Magician in Rabbits Hat, Pirate on Parrot or Elf on Pink Flamingo, they can walk around your event and get great reactions. They can also make balloon models or perform strolling magic. BALLOON MODELLING - Ideal for mix 'n' mingle, whether on stilts or walking around in a colourful costume. They can make anything from a simple hat to an amazing motorbike! STROLLING MAGIC - We can mix 'n' mingle in the shopping centre amusing the crowd performing comedy magic. Ideal where noise or space to perform a static show can be an issue.